Grace, if everyone gave up when they found something almost perfect, we'd never have new recipes. I applaud your high standards and quest for perfection! AN these are very, very nice cinnamon rolls! Cinnamon rolls are by far one of the best things in life. These looks absolutely wonderful. i'll have to give the recipe a try! You probably need to make them 2 or 3 more times just to make sure. 79--the girl who works for me tells me my standards are too high at least 80 times. You are beginning to sound like Mary Poppins, the biggest alliterator (is that a word?) ever. I've made Ree's cinnamon rolls and agree, they are practically perfect. I can't make them often because I will eat them all myself, no sharing! Cinnamon buns baking in the morning are irresistable. I use another tried & tested recipe but I wouldn't refuse this beauty. I think the hardest part of baking is realizing that there's *something* missing, but you don't know what. It's not like cooking, where you can just add a dash of this after it's all said and done. Personally, I'd toss in some butter, but that's just me. I've just had loads of fresh homemade brioche, but this makes me hungry all over again. You know, I never have the feeling anything I bake tastes "perfect"--and that's what always makes me bake some more! We count on you for perfection Grace! These are pretty darn close to that, they look divine! I have made these, as well, and I agree - the best! The coffee and maple in the glaze is very, very tempting. I'm now thinking it's been far too long since I've made cinnamon rolls. I tried to make this a few years ago and I failed. Your cinnamon rolls look great. I might give this recipe a go to impress the boy. standards s/b high! i mean if you're going to comsume all those calories it better taste good, right? right. Isn't it tragic when you have to make something this good over and over for research? Heh. They look wicked good, I've been meaning to make them myself. Oh man! You had to go and make such a great recommendation- now I have to make them. Oh yes, I gotta make em! So many people have raved about these rolls and now you! I guess I will have to break down and make them, too. Your photos sure look perfect! That actually sound do-able. I thought they would be way out of my league. They look gorgeous.I would love to bite into one right now. These rolls definitely have a following and I've heard the maple glaze is phenomenal. I hope you find what you are looking for in a cinnamon roll! Making me feel sooooo guilty for making those cinnamon rolls from a can for my kids this morning. Would you like to adopt a few teens so you can treat them right? These look evil...just plain evil! Those rools look devilishly good and tempting! These rolls do look might amazing. I have been wanting to try them for so long. I admire your high standards and I hope you try these again and give us your version! I will have to give this version a try even though I have a tried and true recipe in my family. I am always up for a little more culinary research. They look delicious, Grace. oooh...so not fair! I need some for my afternoon pick me up! See? Thats the thing about most cinnamon roll recipes that i've eaten...they don't melt in your mouth the way the look like they should. Ok, I'm making these...I don't care what my pants are saying...they'll just have to deal with it! I was just thinking about trying these the other day. I'm on that quest for the perfect cinnamon roll too. I will definitely have to try them after seeing your pictures! My friend made these for me for Christmas one year and what a great gift! They were so good! love the photo of your cinnamon rolls.. I have one word for you ... YUM! OMG. Are you kidding me?! These look awesome. It's dinnertime here and I want one. Is that wrong? Grace, these look amazing! I can't wait to try them. wow... i just passed this onto my boyfriend who is the cinnamon roll king... i need to try these... very soon! Is it bad that I have a single, lonely orange roll sitting in my refrigerator, and now I want to go try my hand at these? Ugh. This is doing nothing for bathing suit preparation. YOU ARE KILLING ME!!! Maple icing? A.m.a.z.i.n.g. I sure wish you were my neighbor because I would be at your door begging for one of these beauties right now. I must make them soon. have seen pioneer woman's and it made me hungry. then i saw it on bakerella and i started to drool. AND NOW I SEE IT ON YOUR BLOG OMG. damn need to make some now. I do like these once in a while and especially if someone else has done all that baking! Yours look fabulous, how fast did they go? 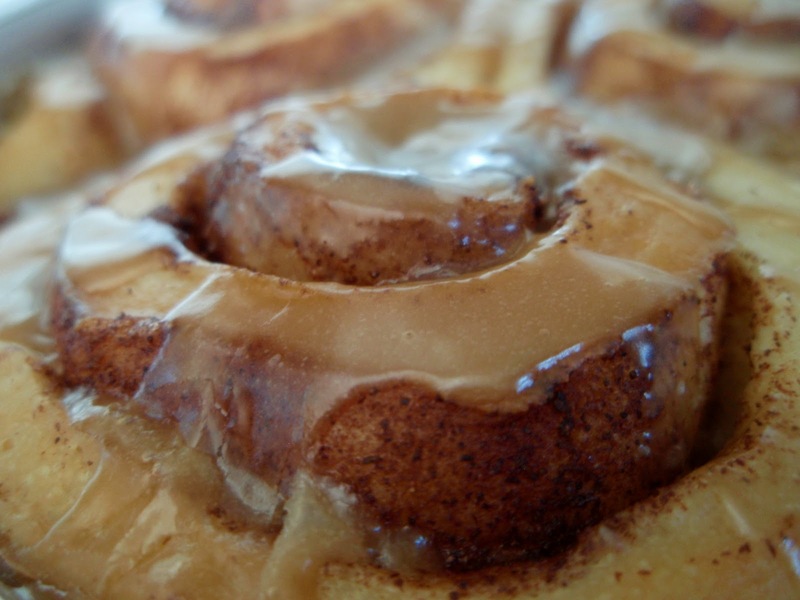 Love, just love cinnamon buns. The first I tried making them, I baked for a wee too long. Got distracted doing some other stuff...need to be more careful next time. I'll volunteer my services as your offical taste tester. These are LOVELY cinnamon rolls. And maple icing? That just brings these babies over the top! Insanely good. 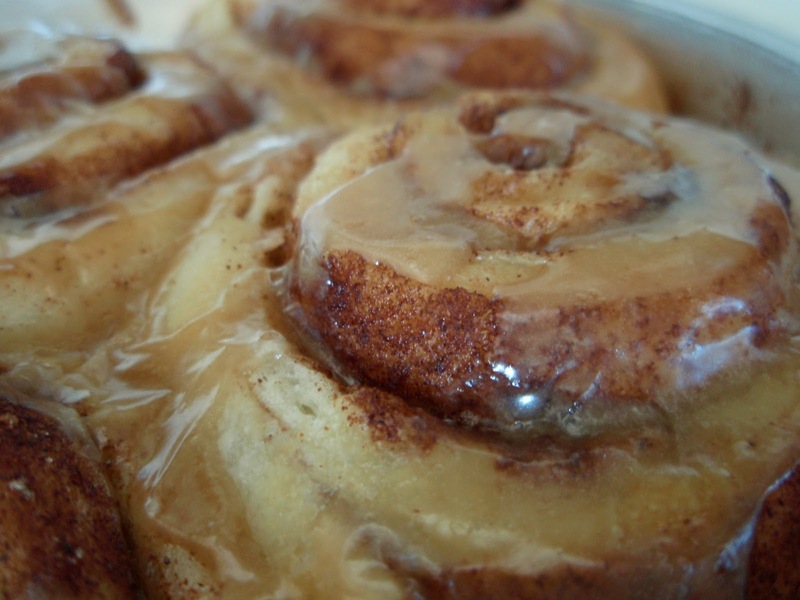 *wiping drool off of my laptop* Boy, those look like serious cinnamon rolls! Just from the photos, these appear to be the ultimate cinnamon rolls- soft textured with lots of cinnamon filling and gooey glaze.I must give them a try while waiting for your next research project Grace! I'm going to have to break down and try those darn things, aren't I? me too, gadzooks those resultant rolls look and sound madly delicious... cinnamon and maple and melt in your mouth all have me thinking of actually baking! They look fantastic! We love cinnamon rolls!!! I would love to make them at home. Oh I love these cinnamon rolls. I made these last year and it was such a hit and everyone always asks me to make them on special occasions. Such a great recipe! Hooray for cinnamon rolls you can make/proof in the fridge the night before. After all, who wants to wake up all bleary-eyed, only to have to wait hours for a treat like that to finally bake up in the oven? oh good lord... these look gooey, warm, and delicious. What a great recipe! Of course you'd be worthy of a slice of pudding. After all Grace is a royal name ;-P! How could you get ANY better than this?? These are about the best looking cinnamon rolls I've ever seen! YUM! Bun perfection! 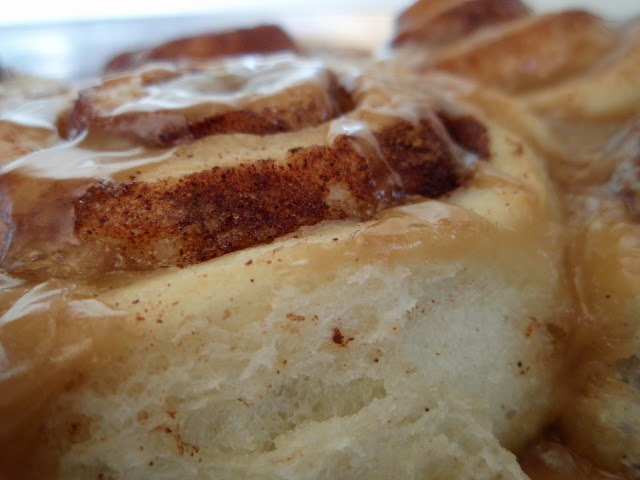 Cinnamon buns are one of my all time favorite treats - I won't complain about new recipes and variations. I. Must. Try. These. Those photos rocked my taste buds! Dang it Woman! Now I'm craving cinnamon rolls and it's 9:00 at night! They looks so ooey gooey and delicious! When it comes to cinnamon rolls I'm pretty picky and still haven't found the perfect recipe. This is the next on my list to try! HI Grace.. Ive made these also and have loved them, give them as gifts, etc. some prefer a different glaze.. but I like the maple:) Looking fabulous! hehehe Grace ... your blog made me laugh and my mouth salivate all at once! Ok, I'm going to HAVE to make these now! These look oh so sinfully delicious! Cinnamon rolls are one of my biggest downfalls! First of all, the photo of that cinnamon bun almost made me pass out. Now that I am fully conscious, I can say that I've been dying to try that recipe too but haven't yet. I wonder what it was missing? If you manage to improve it, you'll have to let me know. I have been meaning to try PW Cinnamon Roll recipe and now that you have given it your nod of approval I may just have to make them. After all you are a lover of cinnamon too so you I trust your opinion. These have been on my to make list forever. I'm very traditional about dessert (even breakfast-y desserts) so I was wondering about the maple topping. Did you make the whole recipe? It's huge. These look just heavenly - perfectly formed and risen...I'm always on the lookout for a great cinnamon roll recipe, and I love topping them with a maple glaze! Well these look just delicious. My mom loves cinnamon rolls so I am going to try out this recipe for mother's day! I love this recipe!! As with everything, I add this and that to tweak it just right. I added 1/4 tsp of vanilla and a smidge of cinnamon to the milk/sugar mixture and that seems to have done it. Also, this can be made sugar-free if you use Splenda--just double the baking powder. It turns out great. As with everything homeade, I just say that the love involved reduces the calorie count!